The class of 2015 honorees include seven students from the four-year Bachelor of Science in Nursing (BSN) program and four registered nurses (RNs) in the 16-month RN-BSN Track. The students comprise the top third of their graduating class. They were recognized during a luncheon March 20 that included School of Nursing administrators, faculty and staff, society board members, and alumni from the program, including four members of the class of 2014 employed as nurses in Redding. The new inductees include BSN students Kaitlyn Olson, Emily Agudo, Cat Amato, Shayla Todd, and Jeremy Wildoner, all of Redding; Dolly Hopper of Red Bluff; and Lysandra Ramirez of Shingletown; and RN-BSN Track students Rachel Barquist of Red Bluff, Tamara Isringhausen and Kellie Knight, both of Anderson, and Susan Wagner-Salanti of Redding. Laura Kobzeff, a ’13 nursing graduate and president of the honor society’s board of directors, delivered a charge. She shared her class verse—Ephesians 2:10—reminding honorees that all patients are made in God’s image. In addition to Kobzeff, the Honor Society of Nursing board of directors includes vice president Kendra Schubert ’13; secretary Nicolle Larkin ’13; Kimberly Shaw, chief nurse executive and vice president of patient care services at Mercy Medical Center in Redding; Leslie Woodson, chief nursing officer at Shasta Regional Medical Center; Michelle Sanders, adult acute care practitioner at Mercy; Kristie Stephens, dean of the School of Nursing; Herman; and student representatives Patricia Brown and Christopher Donaghe. Jan Dinkel, former School of Nursing dean, is an honorary board member. Other members of the Honor Society of Nursing include class of 2013 graduates Kobzeff, Larkin, Schubert, Hannah Hoffman, Tessa Smith, Laura Nasise, and Danae Hicks; and class of 2014 graduates Brown, Donaghe, Jay Bitner, Jenna Curato, Kirt Edgar, Emily Ganim, Sandra Kitchens, Brad O’Brien, and Kimberly Vierhus. Brown, Donaghe, Kitchens, and Curato attended this year’s induction. All are working as nurses in Redding—Brown as a floor nurse at Vibra Hospital of Northern California; Donaghe in oncology at Mercy Medical in Redding; Kitchens in emergency at Shasta Regional; and Curato as a charge nurse at BloodSource. For more information about Simpson University’s School of Nursing, visit simpsonu.edu/nursing. (Top) New Honor Society of Nursing inductees join administrators on the balcony overlooking the new Science and Nursing Center on March 20. 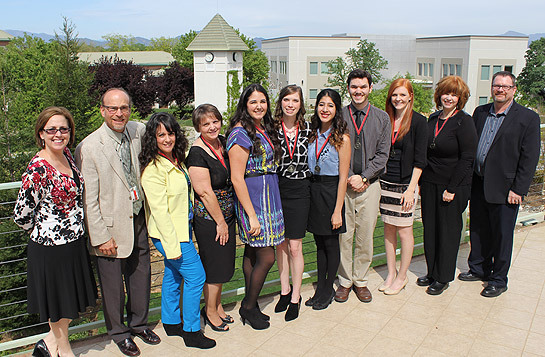 From left, School of Nursing Dean Kristie Stephens, assistant professor Paul Herman, Cat Amato, Dolly Hopper, Emily Agudo, Katilyn Olson, Lysandra Ramirez, Jeremy Wildoner, Shayla Todd, Susan Wagner-Salanti, and Interim President Robin Dummer. Not pictured: Rachel Barquist, Tamara Isringhausen, Kellie Knight. Several 2014 graduates attended the honor society induction. 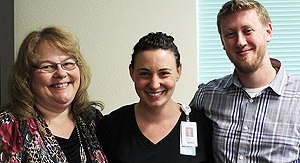 From left, Patricia Brown, a floor nurse at Vibra Hospital of Northern California; Jenna Curato, a charge nurse at BloodSource; and Christopher Donaghe, an oncology nurse at Mercy Medical Center in Redding.